These are just a few of the many flavors you can try from the Walt Disney Parks & Resorts Specialty Coffee Collection. As some of you know, I was able to enjoy some complimentary 30th Anniversary Coffee and here. 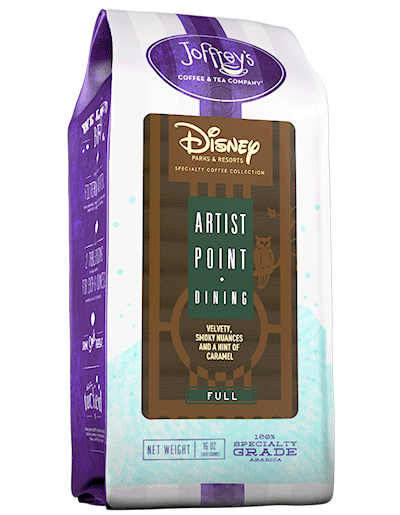 We are also hosting a giveaway until Monday, March 2nd, for a complimentary 16oz bag of coffee from Walt Disney World's Artist Point restaurant at Wilderness Lodge Resort. I'm happy to share some more exciting news that is only for you, the readers of Picturing Disney. Joffrey's Coffee & Tea Company was kind enough to extend a coupon code for 20% off your first purchase using coupon code "picture" on joffreys.com. Offer valid through 3/31/2015.